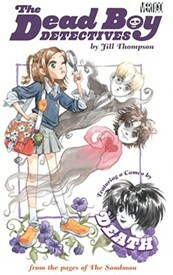 The Dead Boy Detectives brought to us by Jill Thompson, the same illustrator who brought us Death: At Death's Door which I reviewed a few years back. The artwork is by an American artist making the art decidedly Western. The publisher targeted the manga fans because of the size and format, but I got more of an Archie and Jughead kind of vibe. This is a mystery tale about a group of boarding school richies from Chicago who write to the Dead Boy Detectives because their schoolmate goes missing. The girl characters in the book are quirky and fun and might make you laugh. It's a cute little read, but don't count on it to thrill you. The book is best purchased for pre-teens or those who like mysteries like the Hardy Boys. There is a cameo by Neil Gaiman's Death, but not enough to keep a Death fan sated. Though if you are a hard-core Death fan who must read all Death related comics, it might be the first time you've seen Death in sweats and a baseball cap. There is also a rad caricature of Dream on the back cover, but I'm not sure what he's doing there unless it is to just rope more Sandman fans in. For a thin, easy to carry comic, it is actually packed full of visual action. There is no wasted space unless you count the two page introduction to the Sandman library in back. The only extra is an excerpt from Jill Thompson's Death: At Death's Door comic. If you'd like to read more about it, check out the customer reviews at Amazon.com.